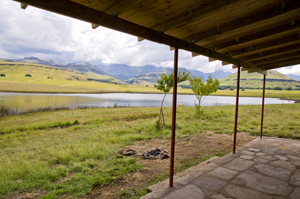 Accommodation is situated on the banks of the 30ha trout dam with unspoiled views of the Drakensberg Mountains that surround the dam. The three cottages, one build of logs, the other from logs and sandstone and the third from only sandstone, are fully appointed. The cottages are not serviced. "The Shack" uses 12v power for lighting and gas for cooking. 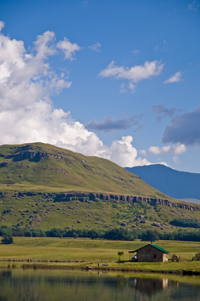 Mountain Views from all cottages. This is a typical view from all the cottage's verandahs. a fireplace with one sack of supplied wood. fresh bedding and extra blankets and fresh towels. one bag of wood per night. thereafter R20 per bag. 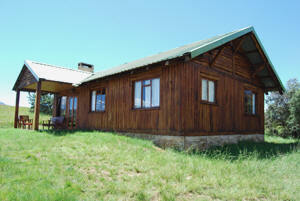 The log cottage has 3 spacious bedrooms, two of which look over the dam towards the mountains. Bedrooms are fully appointed with a double bed in the largest room. The bathroom is designed for to be disabled friendly. 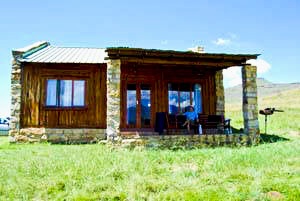 Living space is an open plan kitchen, dinning room and lounge which leads out onto the verandah which has uninterrupted mountain views. The fireplace is placed central to the living area for those cold berg nights. 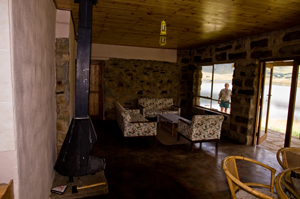 The stone and log cottage has 2 spacious bedrooms, one of which looks over the dam towards the mountains. 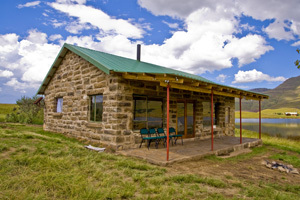 The Stone Shack has 3 spacious bedrooms which all look over the dam. Lighting is provided by 12v solar powered batteries and hot water and cooking is provided by gas. Note that there is no Eskom power. Charging of batteries is not possible.